Home » Free » Manga Sticker » Meropon Dashi! http://www.line-stickers.com/ – Meropon Dashi! 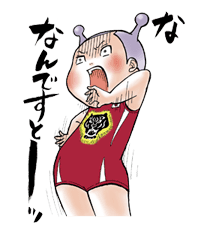 Line Sticker | The first ever comic to serialize in Morning magazine and LINE Manga concurrently! Buy volume 1 of “Meropon Dashi!” on LINE Manga to get these fun stickers. Name LINE Sticker: Meropon Dashi! Copyright : Copyright © Akiko Higashimura / Kodansha Ltd.